How long does it take me to manually book my students’ visits? „Time is money”, and do you know how much is your time really worth? Depending on a person, number of questions and topics, this conversation can take from 3 up to 10 minutes. It’s easy to calculate, that having at least 15 such calls per day, around 2 hours of your time are spent on the phone. From the experience of our clients we know, that there are way more conversations like this, moreover, there are also the emails. Today, in the era of computers and the internet, there’s no need to do everything by yourself, you can, however, with a minimal cost, gain countless possibilities. Use your time wisely, think about new projects, develop your business and, above all, take care of your clients. You don’t have to carry the same conversation, countless times, every day. You don’t have to be always ready to note down your clients, update the schedule every week, check the availability of your teachers, classes or dates. Imagine your studio, where everything changes 360 degrees, where your client has the direct access to any information, no matter what time it is. Every person, wherever he is, can register, check the schedule, book a class and safely pay for a pricing option. Based on our clients’ experience, we know that 90% of bookings are online bookings. Clients prefer to browse the schedule by themselves and book classes whenever they want, without the need of making a phone call to ask for a free spot and book a class. All of our clients agree, that after implementing our online booking system, number of new students increased, moreover, their steady clients visit them ever more often. 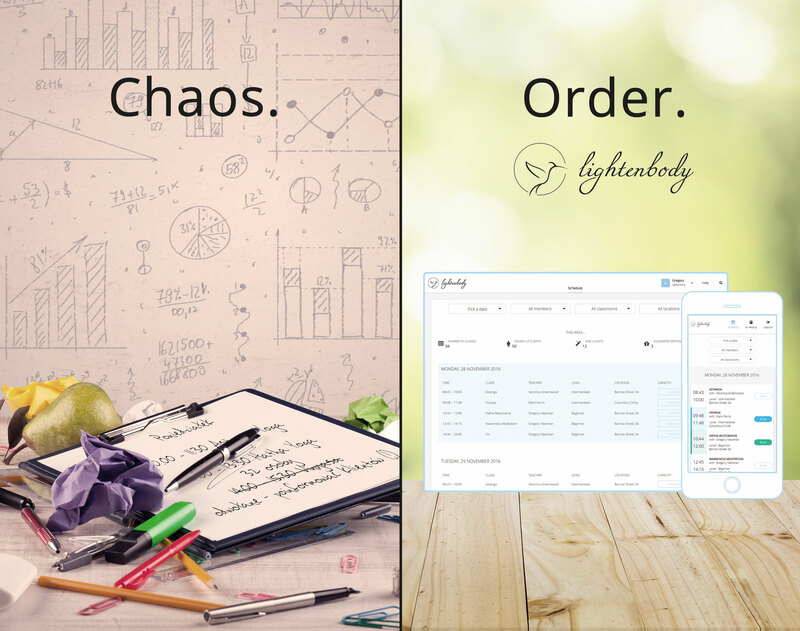 lightenbody™ is a software, that offers a package of benefits for you and your students. Intuitive interface, numerous functionalities, automation and availability of your business 24/7 are only few features of our application. Thanks to lightenbody™ your client creates an account himself and books a class using a phone, tablet or computer, while you can save up some time and use it to effectively develop you business, yourself and your staff.